PARIS – So already another week has passed and somehow I have put nothing on my blog since the Osmo camera post last week after visiting the Café Oz open mic in Pigalle. And here I am a week later with Chapter II: Visiting the Oz open mic again, again with my new Osmo camera. On the other hand, I am happy to report that not only did I get a tiny little bit better with handling the camera, but the open mic itself was miles more fun for me than last week, thanks to the presence of a few friends who suddenly all showed up for the visit of the amazing Aaron Bowen of San Diego, on one of his frequent visits to Europe…. So there I was again with the handheld Osmo steady cam, and this time figuring out how to use it a little better in terms of the image and camera movements, but unfortunately, it was only halfway through the evening that I learned how to improve the sound reception. Unfortunately, for Aaron Bowen’s set, the sound level was still a little low, and so the volume is not very high, and the sound not as crisp as it should be. I managed to correct that problem for the set of the amazing Ash Gray and his fabulous Lowden guitar and playing and singing. Is it possible to say that Aaron Bowen and Ash Gray are opposites in style? No, not really, there’s something that ties their music together, though I’m not sure what it is – maybe just the commitment. In any case, Aaron was in from San Diego, and this time with his electric guitar, and his ever melodious vocals. And this time, joined by Stephen Saxo, who plays…yes, you got it…. Also present was Ventru, whom I have written about many times on this blog, including when I ran into him at an open mic in Montreal, although he is from France and was only in Canada on a holiday. At the time he played last night, I was no longer filming, though, so I’ll wait for a future occasion to Osmo him. In any case, as the experiences grow with the Osmo, I’m hoping it will all come together soon in the best sound AND images possible for this blog…. For my eighth “Morning Exercise Rundown,” – the seventh of which ran on 21 Jan. – I have a whopping collection of something like 10 CDs from various sources, but unique so far in this column, all but the compilations from Mojo and Uncut are from musicians I have met and heard since that last instalment at open mics and through other person connections. None, that is to say, is really well-known. As a reminder to readers, therefore, the idea behind this regular column is that for most of my life I avoided classic daily physical exercise because I felt I was able to avoid it and it bored me to death. In recent years, I had a kind of flash of aged inspiration and realized that I might bore myself to death if I DON’T do exercises. 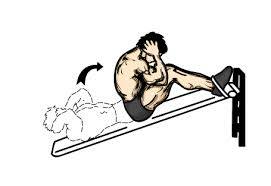 (No time in life for exercise? No! No time in life to NOT exercise!) That did not, however, alleviate the boredom of doing them. So it is that when not doing my nighttime exercise of riding my unicycle around the neighborhood – which does NOT bore me – I do my exercises in the morning (sit ups, push ups, etc.) while listening to new (and old) CDs that I acquire from compilations of magazines, that I also occasionally buy or receive from budding musicians at open mics, or any other source. I first heard Aaron Bowen playing at an open mic in Paris a few months ago, and heard enough in the din of chatter, television and pub noise to think that this guy had some kind of real and individual talent, both vocal and on guitar. So it was with no hesitation at all that when I saw he was doing a short concert at another venue that I decided to go and give a listen. When he announced at the end of that show that he had some CDs for sale, I immediately went on my attack and took both. Hailing from San Diego, and just on one of his many visits to Paris, Aaron Bowen has an ethereal sound and fairly involved lyrics, but ultimately an often fast-moving, classic pop-sound to his melodies and rhythms. And his vocals so often sound like Paul Simon, it’s astounding. From intricate fingerpicking to rambunctious strumming, Bowen puts his own being into the performance, and on the CDs you’re still left with a strong, melodious, imaginary world. 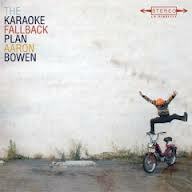 The first album is “The Karaoke Fallback Plan,” which in no way resembles karaoke, and the other is his latest album, “The Quarryman’s Footbath.” They can be listened to many times, too, these CDs, as you delve into the lyrics and add dimensions to your understanding, slowly, as the full sound is not evident on first listen – i.e., this is not bubblegum pop music lyrics, but more comparable to the kind of involved Paul Simon stuff of that writer’s maturity. I first heard and met Marjorie Martinez in Nice when I showed up for the open mic jam session of Wednesday night at the Shapko bar and discovered that it had changed days and I had stepped into a gig by Marjorie. She invited me to play if I wanted to, though, and then a sax player joined her, and the night took on the aspect of a jam…before she returned to playing her gig. I saw her a few nights later playing out front of a restaurant with a bass player and keyboard player. By then, I had already listened to her two CDs that I had grabbed that first night, having been enthralled by her guitar playing, vocals, her musicality in general. Think Joni Mitchell, Rickie Lee Jones, Bonnie Raitt. 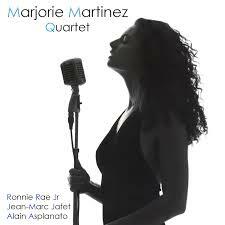 In fact, Marjorie Martinez is a little bit of all them – with a very strong talent for jazz singing as well. She is, it turns out, a major attraction in the Nice music scene, playing all over the place, and recording with some fabulous musicians when not entertaining live. The two CDs that she was selling were both different, with her quartet, being much more jazz-oriented, and the other, called “Travelin’ Alone,” being more pop – middle-of-the-road U.S. country rock style pop, and all in English, her own compositions included. But it’s not easy to pigeon-hole this funky, rocking’ guitar player singer, and even on the album with the quartet her cover songs are by Jimi Hendrix, Lennon and McCartney and Janis Joplin…. 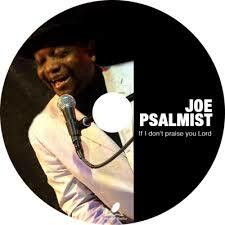 It has taken me three years or so to hear Joe Psalmist in his full band and CD-mode. His new CD, “If I don’t praise you Lord,” is just what it sounds like: One long praise to the Lord in the form of dance and gospel and bluesy melody music from this Spanish expat from Nigeria. I first hear Joe playing his keyboards and singing along at an Irish pub open mic in Barcelona a few years ago and we kept in touch. But we did not meet up again until he invited me to his open mic in April, and I found his vast cross-section of musical vocal talents ranging from classic rock to blues to gospel. This CD is just one long pure praise the Lord hymn of 12 songs that really move you…. Zucco San‘s single “Undefinite Time,” by comparison was a real discovery for me from a musician I have heard in more open mics around Paris than just about any others. I’m used to hearing Zucco’s airy, Jeff Buckley interpretations and other interpretations of classic pop and rock. He almost always wows his audiences with his application and raw emotion; so it was really interesting to hear his voice in a recording like this and see what dimensions it can take in a recording studio. I never had the occasion to hear Zucco San outside of the open mic situation until he invited a friend and I to a showing of some videos and short films he worked on in his other role as actor and musician, and he had some of the CDs there. The music video for Undefinite Time” and the music he wrote for the short film, Toi Femmes, were superb as well. Karim Kanal is the only musician here that I have not met. 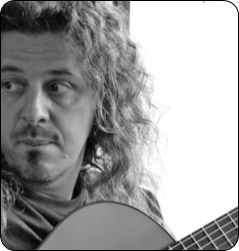 He is my girlfriend’s sometime guitar teacher and a musical mentor at the fabulous Centre Musical Barbara, Fleury Goutte d’Or in Paris, which exists to help nurture young musicians. His CD, “Espace(s),” of his guitar compositions, part lead, part fingerpicking, struck me as a kind of world music fusion jazz kind of thing, that even though it is nowhere near the kind of orchestration of a Weather Report, has a lot of the feel and melody style of such compositions. There’s a little bit of a Pat Metheny feel to this too…. Maybe this is not new as an idea for anyone else, and I never claimed to be a music critic or expert, so what seems new to me is no doubt old hat to those in the know, but when I was listening to the recent batches of compilations from Uncut and Mojo of the latest best music around – according to them – I suddenly had a revelation. I was listening, in particular, I think, to the CD from Mojo for the month of May called “Death Disco” and including such artists from the past and present as Felt, Orange Juice, Bush Tetras, Sonic Youth, The Fall, Young Marble Giants, Cabaret Voltaire, Pere Ubu, The Nightingales and others, and then I was listening to the Uncut compilation “Hey! Ho! Let’s Go!” followed by the Uncut compilation called “One For the Road,” with lots more recent bands, and suddenly, I said to myself that a lot of the new music around today that has a folk feel to it, using acoustic or only quietly used electronic instruments sounds like the spitting image of the electro music of the 1980s, but yes, with acoustic, “traditional” stringed and keyboard instruments. It is the heart and soul of electro, with similar melodic approaches and vocal styles, but not with electronic instruments. So, is this an original thought, or am I showing my ignorance and there’s already a name for it…? I may well have been simply over-intoxicated by my morning exercises and the endorphins that coursed through my system, augmented by the same sent via the music…. Well, that rounds that up. Another, rather large, morning exercise crop of CDs, my eighth edition since I started doing this in April of last year…. 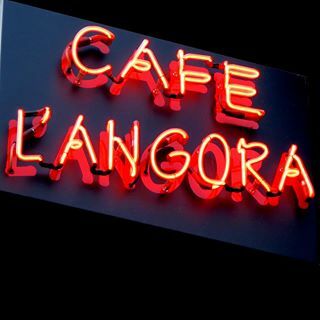 PARIS – There came a moment when I was deeply ensconced in singing and playing “Year of the Cat,” in fact, winding it up, when suddenly I seemed to enter into some kind of acid sound hallucination with my voice and guitar starting to go multiple…. I kept singing a moment, looked over at Brislee and thought that he was doing some kind of wizardry. It turned out that I had simply put my foot on a machine button of some kind that had rocketed off my singing and guitar into a zone from which it would never return…. Until Brislee pressed a few buttons. 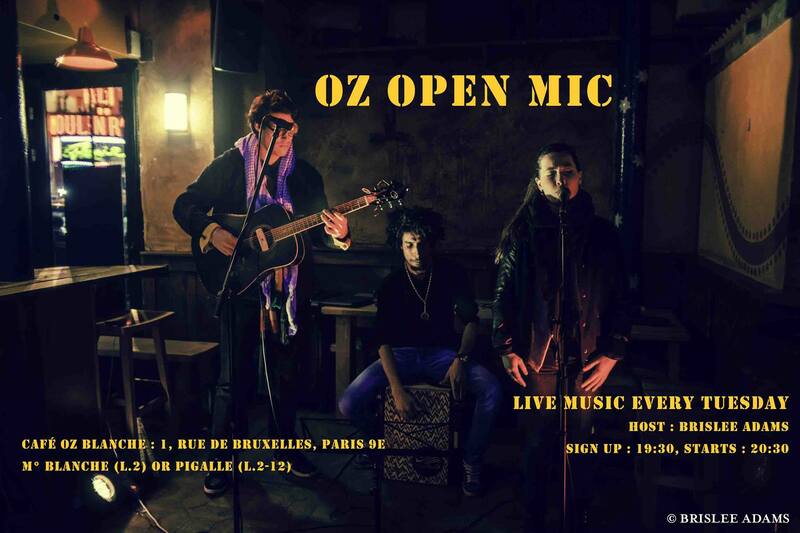 Then we were back to normal – or rather, back to the open mic at the Café Oz bar in Pigalle, an Australian pub where Brislee has been hosting a new open mic for several weeks now. It was my first time there last night, and I will definitely return. This open mic has a different feel to it than the others we know so well in Paris, and part of that is what feels like a clear, warm acceptance by the bar to hold this thing. The sound systems is better than at most, Brislee does a great hosting job, and there was a very impressive list of performers there last night. That included the interesting San Diego musician Aaron Bowen, who has a voice that on his web site someone likened to a cross between Paul Simon and Michael Jackson. It’s too bad they did that, because I had not thought that for a moment last night, just being subjugated by his virtuoso and cool guitar playing, and his velvety and flying voice. Now, yes, I can hear the Paul Simon part – but no Michael Jackson. Check it out yourself! (And I mean both the open mic and the velvety smooth voice of Aaron Michael Paul Bowen.